Air Regulators Sue Calif. Utility Over Massive Gas Leak : The Two-Way A local regulatory body has filed a civil suit against the Southern California Gas Co. alleging negligence over the ongoing natural gas leak near Porter Ranch in Los Angeles. A woman attends a public hearing about the gas leak before the South Coast Air Quality Management District. The agency has ordered Southern California Gas Co. to permanently shut down the well, and is suing the company for negligence. Local air regulators are suing Southern California Gas Co. over the massive ongoing natural gas leak near the Los Angeles neighborhood of Porter Ranch, seeking millions of dollars in penalties. The civil suit alleges that the company's negligence led to injuries and has created "an ongoing public nuisance." The accusation of negligence is broad: The lawsuit accuses the gas company of negligence in designing, constructing, operating and inspecting the well; negligently operating and inspecting the facility as a whole; negligently responding to the leak once it had begun; and negligently hiring and overseeing contractors to work at the well and the facility. The lawsuit also accuses the company of knowingly violating the law, failing to act quickly enough to address the problem and causing physical harm to residents living near the leaking well. The allegations carry a civil penalty, up to $250,000 for every day of the leak — a maximum that could push $30 million, given how long the utility expects it to take to cap the well. The Times and The Associated Press both say SoCalGas declined to comment on pending litigation. As we've reported, the leaking storage well at the Aliso Canyon facility has been spewing methane — a potent greenhouse gas — into the air for months now, and isn't anticipated to be repaired until late February. The odorants in the gas can cause headaches, nausea and vomiting; toxic chemicals such as the carcinogen benzene are also present at low levels. In the case of benzene, the gas company and state regulators say those levels are safe, while the World Health Organization says there is no safe level of airborne benzene. Thousands of people living in nearby Porter Ranch have been evacuated, and Gov. Jerry Brown has declared a state of emergency. Early attempts to plug the well failed due to the high pressure of the leak, and efforts to shut down the well have been delayed until the gas company finishes digging a relief well to reduce the pressure. On Monday, the company announced the relief well has reached 8,400 feet deep and is 200 feet away from intercepting the leaking well — but crossing that last bit of distance "requires precision and accuracy, which takes time." The lawsuit alleging negligence comes just days after the same air-quality regulators hit SoCalGas with an abatement order instructing them to shut down the well permanently and to fund independent research into potential health effects of the leak. Some Porter Ranch residents were upset that the Air Quality Management District hadn't ordered the gas company to shut down the entire Aliso Canyon facility, which contains more than 100 wells. Meanwhile, questions continue to mount around the practices SoCalGas was utilizing at Aliso Canyon — and the broader issue of how effectively natural gas storage facilities are regulated. As Ingrid Lobet reported on All Things Considered last week, the failed gas well was being used in a way that was risky but legal. The well consisted of a narrow tubing inside a casing — instead of using just the tubing to inject and withdraw gas, the company was using both. And the well, which is more than 60 years old, didn't have full concrete protection like a more modern well would. LA Weekly had earlier reported that a shutoff valve designed to stop catastrophic leaks was removed in the 1970s and never replaced — again, perfectly legal for that well, but raising the risk of an unstoppable leak. 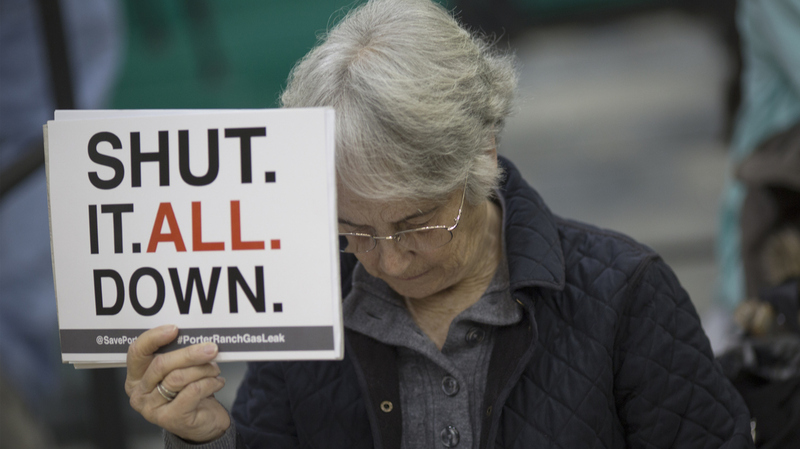 "The leaking well's owner, Southern California Gas Co, warned state utility regulators in 2014 of 'major failures' without a rate hike to pay for comprehensive inspections of 229 storage wells. "Twenty-six of its wells were 'high risk' and should be abandoned — even though they complied with state regulations, the utility wrote in a rate filing. "The previous year, Pacific Gas & Electric pointed to an absence of safety standards for storage wells as reason to launch its own monitoring program that went beyond state rules, according to an internal document obtained by Reuters. "The industry's rising concern underscores the scant oversight of 400 underground natural gas storage facilities in 30 U.S. states. Most storage fields are regulated by states, but national industry groups have pushed for federal oversight - unusual in an industry better known for fighting regulation." You can read more from Reuters.